It’s the fishing app you always wished you had. FishUp let’s you know the best locations to fish in the Baltic Sea area and provides you all the information you need to make your fishing trip successful. You can also share your fishpics through the apps network with other fellow fisherman. 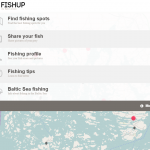 Create your own profile and start fishing with others in the Baltic Sea area.Fishup gives you a social experience while you are fishing or planning a fishing trip. It combines different open datasets with innovative way and gives you tips and advice about the fishing permites, ferry routes and schedules, seasonality, environmental protection and weather fore casts. Development ideas are to add social media linkage to the app where you could share images, experiences and compare e.g. the sizes of your pray. Also the idea is that you could observe fish population changes with the app and bring that information to the popular knowledge. It can also include information about protected fishes (or seasons) and information about polution, algae sightings or visibility of Baltic Sea.